Did you know that there is a national day to celebrate garlic? All those who love the potent herb are celebrating National Garlic Day TODAY! 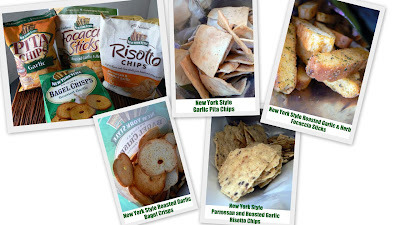 New York Style – the original maker of Bagel Crisps and other crunchy deli snacks – would like to offer you and your readers a suite of New York Style garlic-seasoned snacks to help you celebrate National Garlic Day. Garlic snack lovers across the country will be tearing into bags of New York Style garlic-seasoned snacks in celebration. -Parmesan and Roasted Garlic Risotto Chips™ are the first snack to be made with Arborio rice, the star ingredient of risotto, and are gluten-free and all-natural. -Roasted Garlic Bagel Crisps® are the original New York Style snack -- most famous for their hearty crunch! -Roasted Garlic and Herb Focaccia Sticks™ offer up popular Italian focaccia bread in finger-friendly twice-baked sticks. -Sesame Garlic Crispini® are New York Style’s take on the traditional Mediterranean flatbread found in many of NYC's fine restaurants. -Garlic Pita Chips are made from authentic Mediterranean pocket bread and are the perfect any-time snack. -Garlic Panetini® and Garlic Parmesan Panetini® are oven baked Italian toast slices that make an easy base for your favorite bruschetta recipes and spreads. I've done a previous review on the Risotto chips, and I knew I liked those! I found the garlic pita chips to lack in flavor, loved the bagel crisps, but my absolute fave were the focaccia sticks! Those had tons of flavor and I think they would be great in some soup. Beware of garlic breath after eating these snacks! New York Style has a special coupon so mortals can stock up on their favorite garlic treats for the annual Garlic Day celebration. Visit http://www.newyorkstyle.com/index.php and become a member of the Central Park Club to receive a $0.75 off coupon toward a New York Style garlic snack. For a store near you click here! New York Style® premium deli snacks are famous for their authenticity, twice-baked crunch and great taste. From Bagel Crisps® and Pita Chips to Panetini® Italian toast, Crispini® flatbread, Biscotti, Focaccia Sticks™ and now new Risotto Chips -- New York Style’s products capture the warmth of traditional New York bakeries. New York Style snacks are all-natural and baked, making them perfect for special entertaining occasions or as ‘healthier-for-you' snacks right out of the bag. For more information, great recipes and usage ideas, visit us at www.newyorkstyle.com, become a fan of New York Style on Facebook or follow us on Twitter. THREE "Mommy? I'm Hungry!" readers will each win 4 bags of Garlic New York Style snacks! 1.All you have to do is tell me what other New York Style snacks you'd love to try! This Giveaway ends: 11:59 pm pst, Monday, May 03, 2010. I wrote this review for "Mommy? I'm Hungry!" about New York Style snacks. I received free product to keep for this review. All opinions for this review are that of myself & family. Product info & stock images provided by PR. The Quattro Formaggio Foccacia Sticks sound great too! I want to try the risotto chips. Sounds interesting! I think the garlic parmesan panetini looks yummy! I'd love to try the crispini, they look like this crunchy rye bread that I love to eat with cream cheese!! I'd love to try those risotto chips. I've enver tried that brand. Their chocolate biscotti looks good! The risotto chips sound good! Hi, I shared this giveaway on my FB wall/profile. Hope I did it right--I'm not really skilled with FB--and if I didn't, please remove this entry, as I don't want to cheat. I would like to try the Risotto chips. Mmmm, I would love to try the Rosemary and Sea Salt Focaccia Sticks, the Cinnamon Sugar Pita Chips, and the Chocolate Biscotti! I want to try the garlic bagel crisps. I would like to try the Almond biscotti and the Rosemary & Sea Salt Focaccia Sticks.